In a large bowl, combine all ingredients except the whipped topping. Transfer to a slow cooker coated with nonstick cooking spray. Cover & cook on low for 6-7 hours or until a thermometer inserted reads 160°F. Serve in bowls with whipped topping if desired. 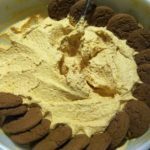 This entry was posted in Confections, Dessert and tagged baking mix, biscuit mix, butter, eggs, evaporated milk, margarine, pudding, pumpkin, Pumpkin Pie Pudding, pumpkin pie spice, sugar, Trish, vanilla extract, whipped topping by Trish. Bookmark the permalink.